In 1998, Scientist, healer and mystic Jude Currivan PhD heard an inner message- a call to undertake a global quest that would transform her life and take her and her fellow travellers on an inner and outer odyssey that would ultimately reveal our hidden heritage and cosmic destiny.The Initial intention of the journeys was to activate the healing energies of twelve ancient Lemurian artefacts around the Earth to support the collective shift of awareness prophesied for 2012.But an even deeper purpose began to unfold.For the native elders of indigenous traditions around the world say that in these momentous times 'we are the ones we have been waiting for'. As did the soular heroes of myth, we are now able to undertake a spiritual journey to re-member the wholeness of who we really are.The twelve activations and the opening of a galactic portal were completed at the December solstice of 2003. 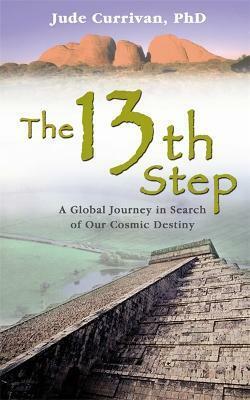 But in 2006, a further call heralded a thirteenth healing journey...As we approach 2012 and experience the birth pangs of a new age, The 13th Step shares an inspirational message of hope and reconciliation. It offers an empowering call for every one of us to embody our own divinity and fulfil our highest purpose as the soular heroes of this transformation. Voted Best Spiritual Book of the Year 2008 by Kindred Spirit readers! Jude Currivan is an internationally well-known sensitive, scientist, healer and cosmic geomancer. Based near Avebury in England, Jude has researched ancient wisdom, consciousness and metaphysics since early childhood. She has a PhD in Archaeology and a Masters Degree in Physics from Oxford University, specialising in cosmology and quantum physics. She has been featured on UK television and the Learning Channel in the US.